This is a same-day service, where Philpotts can pack a container for export, or import containers and deliver them to your depot. We service the Ports of Auckland and all major depots (including Tappers and The Freight Station). We also operate specially-licenced trucks to transport over-weight containers. Swing-lift (or side-loading) trucks (see below) can be used so that we can deliver 20– or 40-foot containers to you without requiring a hoist or other container-lifting facilities at your premises. As with airfreight, we can provide labour to unload cargo from containers. Equally, we can rapidly devan a container and deliver it to you via our smaller curtain-sider trucks which makes unloading easier. 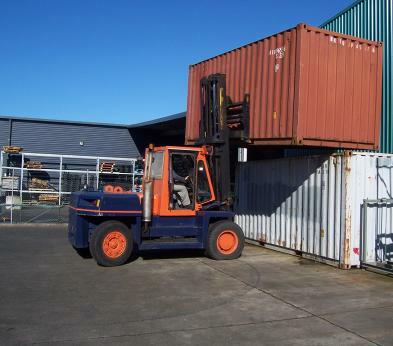 We are able to store containers in our secure yard for competitive rates. Also, we are able to devan containers and store the cargo in the warehouse. 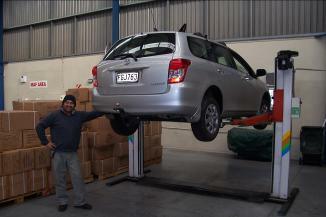 We offer full services for both importing and exporting vehicles. We have vast experience in fitting containers so that collectable and valuable cars can be shipped safely overseas. This extends to full MAF and NZ Customs treatment.